David Campese is one of the game's great players and someone who had the ability to polarise supporters. Brash, arrogant and brilliant, "Campo" bewitched defences and infuriated opponents the world over during a career that took in 101 international caps and 64 tries. He made his international debut against New Zealand in 1982, confounding and irritating great All Black wing Stu Wilson first with his words and then with his goose-step. The All Blacks had their revenge on Campese the following year when he was entrusted with the goal-kicking at Sydney Cricket Ground, missing all four of his kicks as the Wallabies lost 18-8. Campese's attacking brilliance was often counterbalanced by his risk-taking in defence which occasionally landed him and his team in trouble, never more painfully than against the Lions in 1989 when his blunder cost his side the match and ultimately the series. But more often he was the inspiration. His "miracle pass" to set up a try for Tim Horan against the All Blacks at the 1991 World Cup - which Australia went on to win - epitomised his considerable powers of invention and execution. Following the tournament Campese was named as World Player of the Year in 1992. 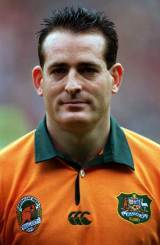 He retired in 1996 as the game was making the transition to professionalism and embracing qualities that Campese had long held for himself. Typically, his final act was to announce his wealth to the public, angering amateur purists, but he was never likely to bow out quietly. In retirement he has continued to provide outspoken quotes to the media - usually on the subject of English rugby - as well as stints training a successions of sides.